When will my newborn finally sleep through the night? If you find yourself waking several times each night to soothe your crying newborn back to sleep, you’re not alone. That may be small comfort, but it should offer some assurance that this is perfectly normal. While you may not be getting sufficient sleep, your little one is probably doing just fine. How much sleep is your newborn actually getting each day? The average infant sleeps 16-17 hours per 24-hour day. That may come as a surprise to a mom who’s getting four hours of sleep herself. You would be justified in asking when all this sleeping is taking place. Unlike older babies and adults, newborns sleep in short three to four hour increments scattered throughout the course of the day. It’s easy to forget all the work those sleepy little bodies are doing. Your baby’s nervous system is rapidly developing as well as her senses. She’s getting bigger and figuring out how her body works. It may not seem like a big deal to a grownup whose body has done all the growing it’s going to do, but it’s exhausting, and she needs a lot of sleep to keep her strong and healthy. 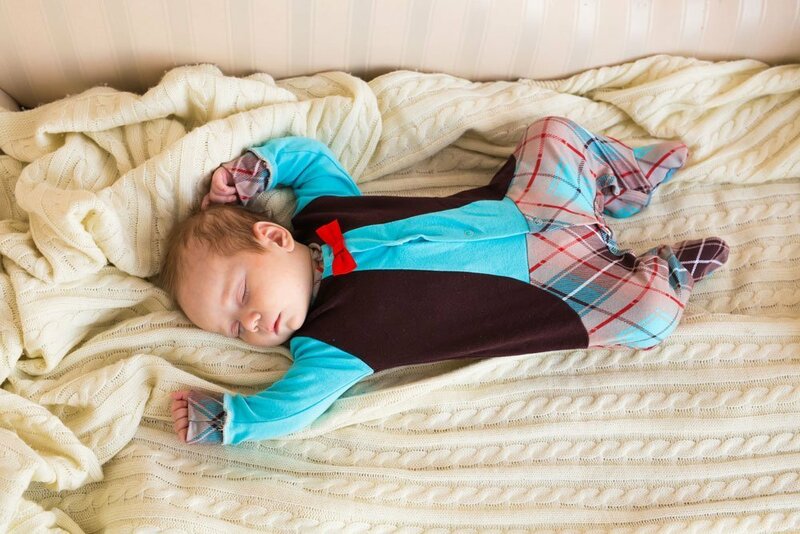 During her first weeks, your baby’s body isn’t attuned to the normal day and night cycle, and she spends more time in REM sleep than in deeper non-REM sleep. Over time, she’ll begin to pick up on the cues that indicate when it’s time to play and when it’s time to rest, but even then, most breastfed babies will wake in the middle of the night for a feeding. That’s not a sign that your baby is malfunctioning. In fact, her natural sleep cycle is very similar to her natural nursing cycle. A newborn should be nursing 8-12 times per day during the first month and 7-9 times per day by one to two months. That’s about every 1½ to 3 hours. In other words, your nursing baby’s daily agenda may resemble a cat’s: one continuous snooze interrupted just long enough for meals. Good for the baby, but exhausting to mom and dad. By the end of her first year, your baby’s sleep pattern will begin to mirror yours with nighttime hours and longer, consolidated sleep periods, but it is possible in some cases to help your nursing infant to sleep through the night earlier, according to a research study conducted by the University of Illinois. and to maximize environmental differences between day and nighttime. By the third week of the study, the infants receiving the special treatment were sleeping in significantly longer episodes than babies in the control group. By week eight, 100% of the treatment babies were sleeping through the night compared to 23% of the control infants. The morning after a long night’s sleep, the treatment infants nursed longer than the control group. However, the total milk intake over a 24 hour period was the same for both groups. Until then, get your ZZZZs where you can, mom! Breastfeeding stimulates the release of oxytocin from your brain, and oxytocin, also known as the anti-stress hormone, often makes moms feel drowsy and warm. Rather than resisting the urge to doze created by breastfeeding, take advantage of it. If it’s possible, follow your newborn’s model, and get in a nap after nursing. It’ll take the edge off of those sleepless nights. If it’s not possible to squeeze naps into your daily routine, remind yourself that this too shall pass. Before long, your newborn will be sleeping soundly through the night, and those long, sleepless nights will be a distant memory.